Here, 11 innovative ways to use as much zucchini as possible while it’s in its prime. Sometimes zucchini is so plentiful during the summer, it can seem overwhelming. We’re here to help. Below, 11 innovative ways to use as much zucchini as possible while it’s in its prime. Plus, many of these recipes will be even easier to fix using this week’s Mad Genius Tips video on the quick and easy way to prep zucchini. This simple, creamy zucchini soup is delicious served either hot or chilled. As much zucchini as it is egg, this flat, Greek-inspired omelet works for brunch, supper or even as an appetizer, sliced into thin wedges. The delicate taste of fresh mozzarella offers a delicious counterpoint to the garlic-and-vinegar-macerated zucchini. These quick quesadillas are perfect for lunch. The sauce for these vegetarian kebabs is made with pureed zucchini, garlic, onion, basil and lemon juice. Tom Colicchio captures the essence of zucchini by braising it quickly and then tossing it with briny olives. 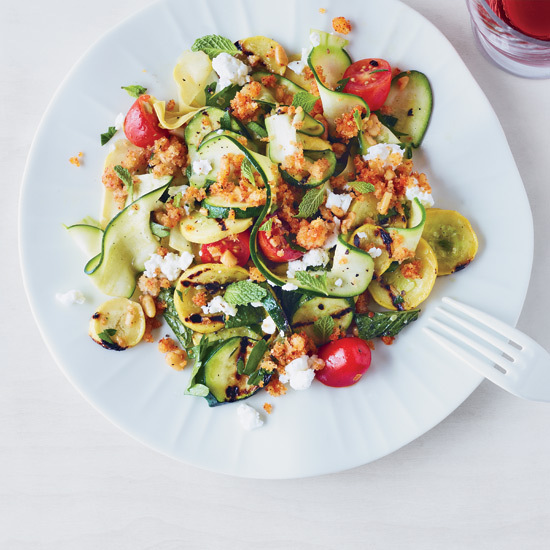 Make this salad at the peak of zucchini season. This fantastic pizza is made with just three ingredients: pre-made pizza dough, zucchini and packaged roasted-garlic hummus. Creamy mozzarella plus smoky zucchini plus tangy olivada equals one great sandwich. Treat shredded zucchini and scallions like noodles for a fun, healthy dinner. This salad gets a delicious crunch from toasted sesame seeds and strips of nori.